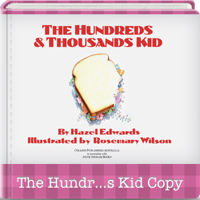 Experience Hazel's vintage picture books in a new digital format and multiple languages from Itunes as downloadable apps and games. Can be shared on smart phones, tablets and in classrooms. Available in Spanish, Dutch, Italian, French, Japanese, Simplified Chinese and German. 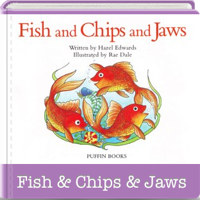 'Fish & Chips & Jaws' is a trio of pet goldfish with attitude. Before 3 goldfish came to live at home, Mum thought all goldfish were boring. Using Tinytap's sound board, reading and question pages, kids can learn just how fun pet fish can be! Developed by: Tiny Tap. Available from Itunes. 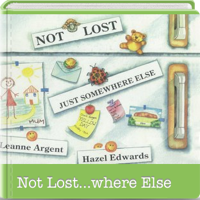 'Not Lost, Just Somewhere Else' is from the quirky viewpoint of a child. How can things be lost, if they are still around? Somewhere else? And how can you be lost if you are with yourself? Even Gran's memory is still somewhere. Developed by Tiny Tap. Available from Itunes. Quintana sees people in the shape of numbers. She figures out answers to problems. A story to encourage creative maths ideas. Quintana is The Hundreds and Thousands Kid , who is five shaped. Feymouse is a big and clumsy cat born into a family of highly talented mice. Explores coping successfully with being different. 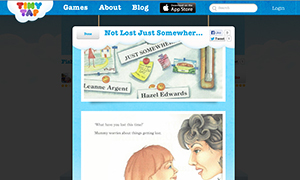 Developed as a vintage picture book apps by Blue Quoll. On Youtube.